This is not about Minneapolis parks, but let’s not be parochial. These coincidences are too good to pass up—and they are little more than a stones throw from Minneapolis. 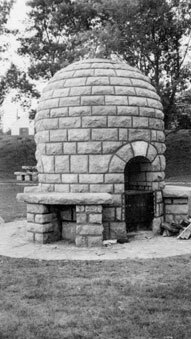 I recently came across more information on Arthur Nichols, a Minneapolis landscape architect I had written about here and another notable park fireplace: the Beehive in St. Louis Park. Read more about this “beehive” fireplace at slphistory.org or follow the link at right. Nichols designed a series of roadside parks along Highway 100 from St. Louis Park to Robbinsdale when Highway 100 was constructed in the late 1930s. Read more about those mostly paved-over parks at the website of the St. Louis Park Historical Society here. The beehive fireplace is of interest not only because it’s a cool design that could accommodate three picnicking families at a time, but because it is similar in several ways to the Minnehaha Park incinerator I wrote about a few days ago. Like the incinerator it was built in 1939. The slphistory web page claims it was built by unemployed masons, which I assume means it was part of a government relief work program, much like the WPA which was responsible for the Minnehaha incinerator. The beehive and incinerator were also both made of locally quarried limestone, the beehive limestone from the Minnesota River bluffs near the Mendota Bridge and the incinerator limestone from at or near Minnehaha Park which is only a couple miles north. What I have yet to learn is whether Arthur Nichols designed the beehive fireplace himself or just specified it in his park plans. If anybody knows, please fill us in. Hello. My mother is nearly 96 and is Arthur Nichols daughter. I will ask her tomorrow about the fireplaces on Lilac Way. I would guess that he did not design them, but am surprised often at the variety of his accomplishments.. I would enjoy speaking with you about my grandfather. He used to let me color in some of the green areas on his landscape drawings, because I stayed inside the lines. Thanks for the note Richard. I’d love to hear more about your grandfather, as well as your mother’s memories of growing up in Minneapolis. I’ll contact you directly.